The ol’ Jack magic is back, savvy? There are several hallmarks to a Pirates movie: a great opening scene revealing Jack Sparrow’s latest predicament, witty humor, highly-quotable dialogue (“I am just as bent as ever, hellishly so,” and “Obstacles arose, ensued, were overcome” are merely two of Jack’s pearls of wisdom), fantastic — and wildly quirky — action set pieces, and a strong set of supporting characters. As far as formulas go, every film series should be envious of such a treasure trove of material and style. Dead Men Tell No Tales — the fifth episode in the series — continues the adventure in fine form, as all those hallmarks are present. In particular, there’s a new strong female lead in Carina Smyth (Kaya Scodelario, the Maze Runner series). She’s persecuted for being a witch because the rather unenlightened populace is mortified by her talk about the stars. She’s merely living in the wrong day and age; throw words around like “astronomer” and “horologist” in conversations with pirates and, well, misunderstandings are to be expected. There’s also a new male supporting lead, Henry Turner (Brenton Thwaites, Maleficent). The surname Turner should strike a chord with those familiar with the original Pirates Elizabeth Swann trilogy. His dad was Will Turner (Orlando Bloom, The Lord of the Rings trilogy). Cast into an eternal curse at the end of... um... At World’s End (stick around through the end of the end credits for a first look at Henry), Will’s been living under the sea, but his son’s a smarty and mythology buff right on par with Carina. When Henry and Carina set aside their differences, and join forces with the wayward Capt. Jack Sparrow (Johnny Depp, Alice in Wonderland), they go on a quest to find Poseidon’s trident and — hopefully — right wrongs in each of their lives. As should be expected, the movie opens with Jack in another preposterous and precarious situation. It in turn leads to a couple great action sequences. The most devilishly entertaining one finds him under the service of Madame Guillotine while Carina stands across the town square at the wrong end of the hangman’s noose. They spar verbally before they are to meet their untimely ends, which turns into quite a fracas — with the guillotine morphing into something ever-so-slightly shy of an amusement park ride. And a large chunk of this Pirates flick is delightfully and comfortably situated in the same hoot zone that made its precursors box office gold. It’s a shame some can’t simply accept the series for what it is — and its cleverness is criminally underrated in some circles. Alas, a pirate’s life isn’t everyone’s cup of tea. Savvy? Having plundered the legends of the Kraken, voodoo, mermaids, the Fountain of Youth and Blackbeard, this Pirates sets sail for Poseidon, using a diary from Galileo as a guide. Gratuitous photo of Jack Sparrow, savvy? With a story crafted by newcomer Jeff Nathanson (Catch Me If You Can) and continuing scribe Terry Rossio (Shrek), the series has added two more directors to try to keep Jack Sparrow on course. They’re Joachim Rønning and Espen Sandberg, the crazy filmmakers behind 2012’s Oscar-nominated Kon-Tiki. What’s so crazy about them? They basically shot Kon-Tiki twice. This highly-recommended movie, which takes place largely at sea, was shot once in Norwegian and once in English. All with the same cast. Quite a technical challenge, especially considering all of the natural elements with which filming had to contend. It’s unheard of in today’s industry, but back in the early days of film, it was a fairly common practice. Doing so, though, no doubt gave Rønning and Sandberg the sea legs needed to tackle a Pirates adventure. With Capt. Salazar (Javier Bardem, Skyfall) in search of revenge against Jack (the circumstances explained in a nifty flashback sequence featuring a young Jack earning the nickname “Sparrow”) and Capt. Barbossa (Geoffrey Rush, The King’s Speech) once again finding ways to make Jack miserable, Jack’s up against it once agin. 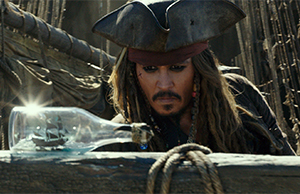 He’s severely down on his luck, with even the price of his bounty on a stark decline (maybe hitting a little too close to home for Depp, who’s recently made headlines for the wrong reasons); at the point of desperation, Jack trades in his beloved compass for booze. Put it all together and the setup for a fun summer romp is made and fulfilled. It’s nice to have Jack back. And it’s a treat to see some really great cameos. Under the circumstances of the story, it’s not much of a giveaway to say Bloom returns, but that leaves two sweetly placed appearances to savor. And one further proves there’s a whole lotta music running through Jack Sparrow’s bloodline.